BrightTALK caught up with Giovanni Vigna from University of Santa Barbara & Lastline for an in-depth conversation on the current state of information security, today's threatscape and a discussion on the cyber industry. BrightTALK caught up with KPN Telecom's Jaya Baloo for an in-depth conversation on the current state of information security, today's threatscape and a discussion on the cyber industry. 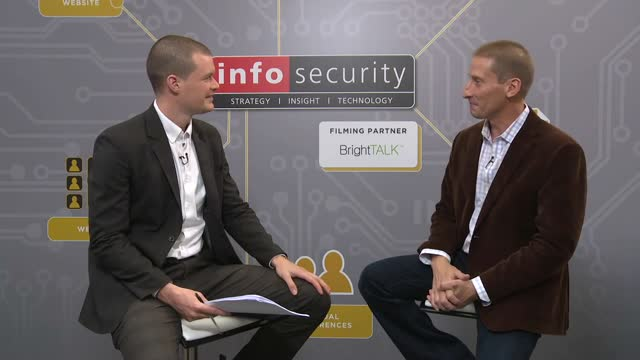 BrightTALK caught up with Fidelis Security's John Bambenek for an in-depth conversation on the current state of information security, today's threatscape and a discussion on the cyber industry. BrightTALK caught up with Kai Roer, the Creator of the Security Culture Framework for an in-depth conversation on security culture and it's value to businesses today. Kai also talks through the findings of the Security Culture Report 2017, which can be accessed via the videos attachments. BrightTALK caught up with Barracuda Network's SVP for Security Hatem Naguib for an in-depth conversation on the differences in public and private cloud; which is more secure; how security professionals can highlight the difference to their board and the steps needed to migrate. on the current state of information security, today's threatscape and a discussion on the cyber industry. BrightTALK caught up with Dr Jessica Barker for an in-depth conversation on the current state of information security, today's threatscape and a discussion on the cyber industry. BrightTALK caught up with Zscaler's Chris Hodson for an in-depth conversation on the current state of information security, today's threatscape and a discussion on the cyber industry. BrightTALK caught up with Tripwire's Paul Edon for an in-depth conversation on the current state of information security, today's threatscape and a discussion on the cyber industry. One month on from the WannaCry attacks, we'll be discussing their influence on the cyber security industry; whether it was a success for the cyber criminals and what organisations could've done to be better protected. This expert panel will cover how the ransomware spread, why there's been an explosion over the last few years, why businesses are especially vulnerable and how the malware is more and more intertwined with crypto currencies. Fighting Ransomware was a top priority on security professionals' minds in 2016 and that will only continue into 2017. Tune into this live panel to get insights and takeaways to protect your business from the threat of ransomware. IoT networks grow by the day - prompting sleepless nights from security professionals the world over. As more and more devices join the network, how can we ensure that they're not becoming the latest weak link in the network? This expert panel will look at vulnerabilities in the IoT, those that are more obvious and those that perhaps aren't. It'll also cover the latest threats targeting IoT networks; the mechanisms and techniques that are being used and how to stop them. The IoT will be critical to business and consumer life from hospitals to connected cars to factory floors. Security and privacy remain key concerns and this panel will break down what the explosion of IoT networks will mean for security professionals. GDPR and its May 2018 deadline are now fully the minds of the vast majority of security professionals and with massive fines on the horizon for non-compliance, now is a better time than ever to get to grips with the legislation and ensure that your organisation is secure and compliant. Join this live interactive panel where our selection of industry experts will be discussing the ins and outs of the regulations; how to prepare, steps to take and what to look out for. It’s vital that your business has carried out the relevant preparations for compliance by then to make sure you don’t get whacked with a huge fine of up to £15m or 4% of your organisation’s global annual turnover. Not only are there potentially huge financial repercussions, but leaving your business open to attack and your customers at risk can cause serious reputational damage. This expert panel will be discussing next steps to make sure that the next 12 months are as pain free as possible. Join BrightTALK on the forefront of cyber conversation at Infosecurity 2017. From the 6-8 of June, BrightTALK will be leading the cyber conversation from our mobile studio at Infosecurity Europe. Find us at stand Q90 where you can watch and listen to a range of live interviews, panels and discussions on the hot topics within the security space. We've invited the industry's leading thinkers to talk with us about GDPR, WannaCry, the IoT, privacy, incident response, cyber warfare and much much more. Tune in to live panel sessions featuring the top security experts; watch in-depth, one-on-one interviews with security leaders and hear from the industry's pioneering vendors.